This special two cent stamp was issued in honor of General Casimir Pulaski in recognition of the one hundredth and fiftieth anniversary of the death of the noted Polish patriot and hero of the American revolution. The issue has a likeness of General Pulaski modeled from a portrait in Jone's History of Georgia, printed from an etching by H. B. Hall in 1871. 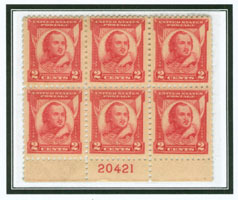 The Pulaski stamp was first issued in a variety of U. S. post offices on January 16th,1931. General Pulaski Memorial Day is a United States holiday in honor of General Kazimierz Puaski, a Polish hero of the American Revolution. This holiday is held every year on October 11 by Presidential Proclamation, to commemorate his death from wounds suffered at the Siege of Savannah on October 9, 1779 and to honor the heritage of Polish Americans. The observance was established in 1929 when Congress passed a resolution (Public Resolution 16 of 1929) designating October 11 as General Pulaski Memorial Day. Every President has issued a proclamation for the observance annually since (except in 1930). New York City has an annual Pulaski Day Parade and Grand Rapids, Michigan holds Pulaski Days at this time. Some areas with large Polish-American populations instead celebrate Casimir Pulaski Day on the first Monday of every March, marking Pulaski's March 4, 1746 birth. Wisconsin, Illinois, and Indiana have state recognition of this holiday, which is particularly popular in Chicago and Milwaukee. The Siege of Savannah was an encounter of the American Revolutionary War in 1779. The year before, the city of Savannah, Georgia had been captured by a British expeditionary corps under Lieutenant-Colonel Archibald Campbell. The siege itself consisted of a joint Franco-American attempt to retake Savannah from September 16, 1779 to October 18, 1779. On October 9, 1779, a major assault against the British siege works failed. During the attack, Polish Count Kazimierz Puaski, fighting on the American side, was mortally wounded. With the failure of the joint American-French attack, the siege failed, and the British remained in control of Georgia until July 1782, close to the end of the war. The battle is much remembered in Haitian history; the Fontages Legion, consisting of over 500 gens de couleur free men of color from Saint-Domingue fought on the French side. Henri Christophe, who later became king of independent Haiti, is thought to have been among these troops. This event is commemorated each year by presidential proclamation on General Pulaski Memorial Day. This stamp was issued to commemorlate the 50th anniversary of the founding of the American Red Cross. The issue is represented by a Red Cross nurse kneeling before the globe with outstreched hands, a reproduction from a 1930 poster entitled "The Greatest Mother". 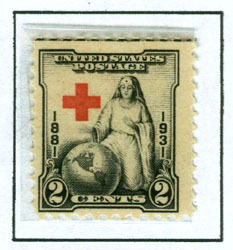 The Red Cross stamp was placed on sale May 21st, 1931 at Washington D. C. ( National Headquarters of the Red Cross ), and Dansvill, N. Y., where the first local chapter was established. The American Red Cross (also known as the American National Red Cross) is a humanitarian organization that provides emergency assistance, disaster relief and education inside the United States, and is the designated U.S. affiliate of the International Federation of Red Cross and Red Crescent Societies. 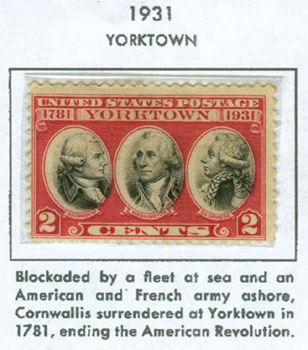 The Battle of Yorktown stamp commemorates the one hundreth and fiftieth anniversary of the surrender of Cornwalis. The issue shows portraits of Rochambeau, Washington, and De Grasse. In August 1781, General George Washington learned that Major General Lord Charles Cornwallis's army was encamped near Yorktown, VA. After discussing options with his French ally, Lieutenant General Jean-Baptiste Ponton de Rochambeau, Washington decided to quietly move his army away from New York City with the goal of crushing Cornwallis' isolated force. Departing on August 21, the Franco-American army began marching south. As any success would be dependent upon the French navy's ability to prevent Cornwallis being resupplied, this movement was supported by the fleet of Rear Admiral Comte de Grasse. Arriving in the Chesapeake, de Grasse's ships assumed a blockading position. On September 5th, a British fleet led by Rear Admiral Sir Thomas Graves arrived and engaged the French. In the resulting Battle of the Chesapeake, de Grasse succeeded in defeating the British and leading them away from the bay. Disengaging, the French returned to the Chesapeake and resumed blockading Cornwallis' army. Arriving at Williamsburg, Washington met with de Grasse aboard his flagship Ville de Paris on September 17th. After securing the admiral's promise to remain in the bay, Washington focused on concentrating his forces. As troops from New York reached Williamsburg, they joined with the forces of the Marquis de Lafayette who had been shadowing Cornwallis' movements. With the army assembled, Washington and Rochambeau began the march to Yorktown on September 28th. Arriving outside the town later that day, the two commanders deployed their forces with the Americans on the right and the French on the left. A mixed Franco-American force, led by the Comte de Choissey, was dispatched across the York River to oppose the British position on Gloucester Point. For the next three days, French and American guns pounded the British lines around the clock. Feeling his position collapsing, Cornwallis wrote to Lieutenant General Henry Clinton on October 10 calling for aid. The British situation was made worse by a smallpox outbreak within the town. On the night of October 11th, Washington's men began work on a second parallel, just 250 yards from the British lines. Progress on this work was impeded by two British fortifications, Redoubts #9 and #10, which prevented the line from reaching the river. Led by Colonel Robert Abercrombie the attack succeeded in taking some prisoners and spiking six guns, but was unable to breakthrough. That night, Cornwallis shifted 1,000 men and his wounded to Gloucester Point with the goal of transferring his army across the river and breaking out to the north. As the boats returned to Yorktown, they were scattered by a storm. Out of ammunition for his guns and unable to shift his army, Cornwallis decided to open negotiations with Washington. At 9:00 AM on October 17th, a single drummer mounted the British works and beat the long roll as a lieutenant waved a white flag. With no other choice, Cornwallis complied and the final surrender documents were signed on October 19th. At noon the French and American armies lined up to await the British surrender. Two hours later the British marched out with flags furled and their bands playing "The World Turned Upside Down." Claiming he was ill, Cornwallis sent Brigadier General Charles O'Hara in his stead. Approaching the allied leadership, O'Hara attempted to surrender to Rochambeau but was instructed by the Frenchman to approach the Americans. As Cornwallis was not present, Washington directed O'Hara to surrender to Lincoln, who was now serving as his second-in-command. With the surrender complete, Cornwallis's army was taken into custody rather than paroled. Shortly thereafter, Cornwallis was exchanged for Henry Laurens, the former President of the Continental Congress. The victory at Yorktown was the last major engagement of the American Revolution and effectively ended the conflict in the American's favor. 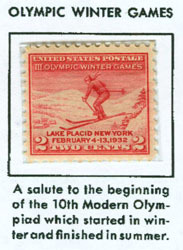 This issue is in honor of the International Olympic Winter Games held in Lake Placid, N. Y. in February 1932. The theme of the stamp is of a ski jumper in action. Originally, the ancient Olympic Games were held in Olympia, Greece, from the 8th century BC to the 5th century AD. In the late 19th century, Baron Pierre de Coubertin was inspired by Olympic festivals to revive the Games. For this purpose, he founded the International Olympic Committee (IOC) in 1894, and two years later, the modern Olympic Games were established in Athens. The IOC has since become the governing body of the Olympic Movement, whose structure and actions are defined by the Olympic Charter. The evolution of the Olympic Movement during the 20th century forced the IOC to adapt the Games to the world's changing social circumstances. Some of these adjustments included the creation of the Winter Games for ice and snow sports, The IOC also had to accommodate the Games to the varying economical, political, and technological realities of the 20th century. 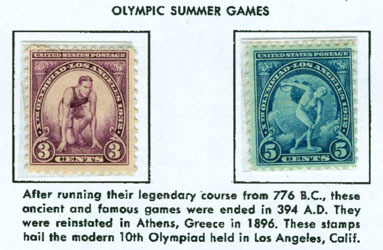 These special series of postage stamps in the 3-cent and 5-cent denominations were issued in recogintion of the International Olympic games held at Los Angeles, California from July 30th to August 14th, 1932. The three cent stamp has a likeness of an Olympic sprinter in a crotched position. The five cent is a representation of a Roman discuss thrower from the statue "Discobolus"
The stamps were first placed on sale at the main post office in Los Angeles, Calif. on June 15th, 1932. The 1932 Summer Olympics, officially known as the Games of the X Olympiad, were an International multi-sport event which was celebrated in 1932 in Los Angeles, California, United States. No other cities made a bid to host these Olympics. Held during the worldwide Great Depression, many nations and athletes were unable to pay for the trip to Los Angeles. Fewer than half the participants of the 1928 Summer Olympics in Amsterdam returned to compete in 1932. U.S. President Herbert Hoover did not attend the Games, becoming the first sitting head of government not to appear at an Olympics hosted in that country. This stamp was authorized in commemoration of the sixth anniversary of the establishment of Arbor Day, on April 22nd 1932, and in honor of the one hundredth anniversary of the birth of J. Sterling Morton, through whose efforts a day was first officially set aside for the planting of trees by the state of Nebraska in 1872. 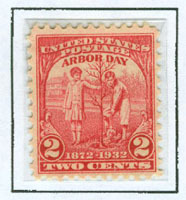 The stamp's theme is a tree being planted by a young girl and boy. The Arbor Day stamp was first placed on sale in Nebraska City, Nebr., the former home of J Sterling Morton, on April 22nd, 1932. Morton felt that Nebraska's landscape and economy would benefit from the wide-scale planting of trees. He set an example himself planting orchards, shade trees and wind breaks on his own farm and he urged his neighbours to follow suit. Morton's real opportunity, though, arrived when he became a member of Nebraska's state board of agriculture. He proposed that a special day be set aside dedicated to tree planting and increasing awareness of the importance of trees. Nebraska's first Arbor Day was an amazing success. More than one million trees were planted. A second Arbor Day took place in 1884 and the young state made it an annual legal holiday in 1885, using April 22nd to coincide with Morton's birthday. This stamp was issued to commemorate the two hundredth and fiftieth anniversary of the arrival of William Penn in America. 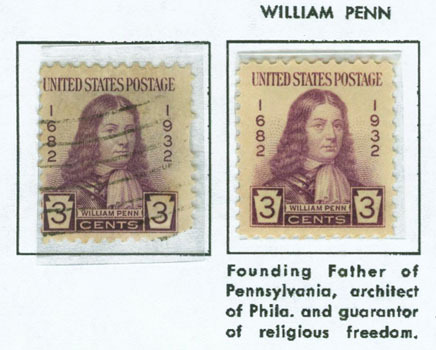 The stamp is represented by a likeness or William Penn, reproduced from an engraving of a portrait painted from life in 1666, the original of which is in the possesion of the Pennsylvania Historical Society. The William Penn stamp was first place on sale on October 24th, 1932, at post offices in New Castle, Del, Chester, Pa and Philadelphia, Pa. 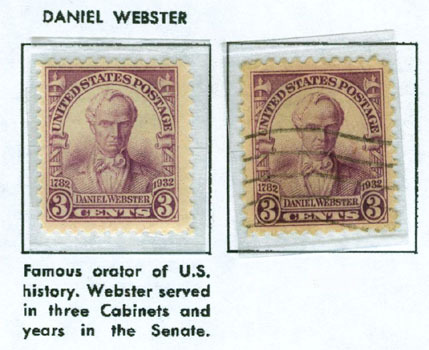 This stamp was autorized in honor of the one hundreth and fiftieth anniverary of the birth of Daniel Webster. The image is a full face likeness of Webster reproduced from a marble bust by Daniel Chester French at Franklin, N. H., the birthplaceof Webster. The Webster issue was first placed on sale October 24th, 1932, at Exeter, Franklin, and Hanover, N. H.
Daniel Webster (January 18, 1782 – October 24, 1852) was a leading American statesman during the nation's Antebellum Period. He first rose to regional prominence through his defense of New England shipping interests. His increasingly nationalistic views and the effectiveness with which he articulated them led Webster to become one of the most famous orators and influential Whig leaders of the Second Party System. Daniel Webster was an attorney, and served as legal counsel in several cases that established important constitutional precedents that bolstered the authority of the Federal government. As Secretary of State, he negotiated the Webster-Ashburton Treaty that established the definitive eastern border between the United States and Canada. Primarily recognized for his Senate tenure, Webster was a key figure in the institution's "Golden days". So well-known was his skill as a Senator throughout this period that Webster became the northern member of a trio known as the "Great Triumvirate", with his colleagues Henry Clay from the west and John C. Calhoun from the south. His "Reply to Hayne" in 1830 was generally regarded as "the most eloquent speech ever delivered in Congress." As with Henry Clay, Webster's desire to see the Union preserved and conflict averted led him to search out compromises designed to stave off the sectionalism that threatened war between the North and South. Webster tried three times to achieve the Presidency; all three bids failed, the final one in part because of his compromises. Similarly, Webster's efforts to steer the nation away from civil war toward a definite peace ultimately proved futile. Despite this, Webster came to be esteemed for these efforts and was officially named by the U.S. Senate in 1957 as one of its five most outstanding members.